Composition : Each vial contains Cisplatin BP 10 mg (1 mg/ ml). Each vial contains Cisplatin BP 50 mg (1 mg/ ml). Indication : Neoplat injection is indicated as therapy to be employed as follows: Metastatic Testicular Tumors - In established combination therapy with other approved chemotherapeutic agents in patients with metastatic testicular tumors who have already received appropriate surgical and/or radio therapeutic procedures. Metastatic Ovarian TumorsIn established combination therapy with other approved chemotherapeutic agents in patients with metastatic ovarian tumors who have already received appropriate surgical and/or radio therapeutic procedures. An established combination consists of Neoplat (Cisplatin) and cyclophosphamide. Neoplat, as a single agent, is indicated as secondary therapy in patients with metastatic ovarian tumors refractory to standard chemotherapy who have not previously received Cisplatin Injection therapy. Advanced Bladder Cancer - Neoplat (Cisplatin) is indicated as a single agent for patients with transitional cell bladder cancer which is no longer amenable to local treatments such as surgery and/or radiotherapy. 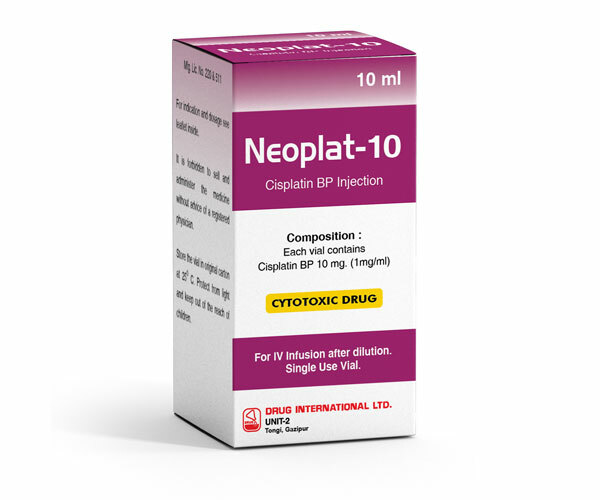 Non Small Cell Lung Carcinoma- Neoplat (Cisplatin) in combination with other chemotherapeutic agent is indicated for the treatment of non small cell lung cancer in patients who are not candidates for potential curative surgery and/ or radiation therapy. Dosage and administration : Cisplatin injection is administered by slow intravenous infusion. It should not be given by rapid intravenous injection.Note: Needles or intravenous sets containing aluminum parts that may come in contact with Cisplatin Injection should not be used for preparation or administration. Aluminum reacts with Cisplatin Injection, causing precipitate formation and a loss of potency. Metastatic Testicular Tumors - The usual Cisplatin Injection dose for the treatment of testicular cancer in combination with other approved chemotherapeutic agents is 20 mg/m2 IV daily for 5 days per cycle. Metastatic Ovarian Tumors - The usual Cisplatin Injection dose for the treatment of metastatic ovarian tumors in combination with cyclophosphamide is 75 to 100 mg/m2 IV per cycle once every 4 weeks (DAY 1). The dose of cycloposphamide when used in combination with cisplatin is 600 mg/m2 IV once every four weeks (DAY 1). In combination therapy, Cisplatin Injection and cyclophosphamide are administered sequentially. As a single agent, Cisplatin Injection should be administered at a dose of 100 mg/m2 IV per cycle once every four weeks. Please see prescribing description for more description. Use in pregnancy and lactation : Pregnancy Category D. There are no adequate and well controlled studies in pregnant women. Cisplatin has been reported to be found in human milk. It is not known whether cisplatin is excreted in human. Packing : Neoplat 10 - Each box contains one vial of 10 ml solution. Neoplat 50 - Each box contains one vial of 50 ml solution.